Located on Limassol’s coveted coastline, Limassol Del Mar is at the forefront of the area’s property boom and stands out above the competition in the city’s ongoing transformation. The world class development stretches across an impressive 170 metres of sea frontage, allowing unobstructed sea views from the ground to the top floor apartments. After the successful first phase, all eyes are now on phase two, which includes the delivery of apartments in the “The Signature Collection”. These homes will be situated in the second tower comprising 27 floors and offering a range of two to five-bedroom luxury apartments and penthouses offering upgraded and branded specifications. 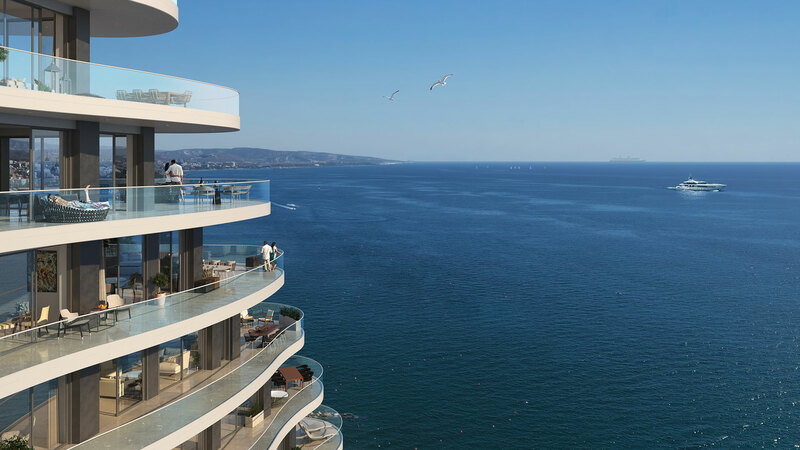 The new tower will sit within the wider Limassol Del Mar development and feature beautifully crafted terraces with dual-aspect panoramic views across the Limassol coastline and beyond. After the immense success of phase one, buyers around the world will no doubt be anticipating the release of “The Signature Collection” which is expected to exceed all expectations in terms of sales and international demand. Cypeir Properties Ltd is a joint venture between two of Cyprus’s most renowned developers, The Leptos Group and D.Zavos Group, who are delivering together Limassol Del Mar. The overall investment is covered by the income from the apartment sales, which have secured the project’s completion. The strong sales are testament to the project’s global appeal and indicate a rising demand for prime real estate in Cyprus. There have been buyers from 15 different countries and a range of business people, professionals and investors who have chosen to invest in Limassol Del Mar for their first or second home. The construction works have been assigned to a consortium of internationally renowned contractors. These companies have a wide expertise in the field of high-rise developments and the assignment was based on their eminent professionalism, successful history, international high standards and novelty. The construction progress is ongoing and fast paced as above the ground work continues, ready to deliver apartments to their new owners on time. Located on Cyprus’ south coast, Limassol is the island’s most cosmopolitan city. With a 17km coastline of azure water and blue flag beaches, as well as a wealth of history and culture, it is a hub for both business and leisure. Limassol Del Mar is at the heart of this, overlooking the seafront, and only minutes’ away from the city’s foremost shopping district. Limassol Del Mar is soon to become a destination in its own right, attracting investors and visitors alike to its thriving waterfront location. State of the art amenities will feature throughout the gated community, including an impressive commercial offering, Le Plaza Del Mar. Le Plaza Del Mar will form the ground level of Limassol Del Mar, hosting the city’s hottest new restaurants, cigar lounge, wine bar and café, serving traditional Cypriot dishes alongside international favourites. Aimed at pleasing the most discerning audience, it will offer its residents a great diversity of the world’s leading fashion houses and boutiques. Residents will also enjoy an array of five star facilities including a spa, gym, residents’ lounge, concierge, club house, and an outdoor and indoor swimming pool. As the area is most exclusive address on Limassol’s coastline, purchasing one of Limassol Del Mar’s seafront properties is a once-in-a-lifetime opportunity. A destination with international appeal, Cyprus can be reached in just over four hours from London, Moscow and Dubai, with direct flights running frequently. Prices start from €1.5 million for a two-bedroom apartment.